Join Marketplace JC as they kick off their Magnolia Landing: Summer Series with this inaugural event which runs from 11am-4pm at 615 Pavonia Avenue and enjoy a day full of live music, food, and shopping. 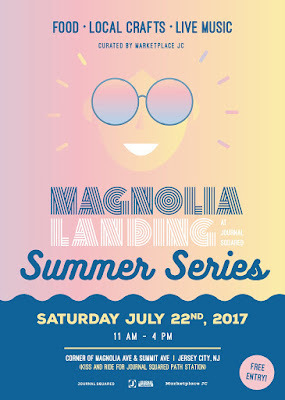 The Summer Series will run every other Saturday and will host local bands, food from vendors like O'Lala's Empanadas, Gusti Di Sicilia, vegan vendor Raw Roots Cafe, Gypsy Pops and more, as well as local artisans and crafters. This Saturday is the launch of the new Lutze Eats, an expansion of the Lutze Biergarten with pop-up food vendors every weekend ranging from mini-donuts to kati rolls. Bucket & Bay is celebrating their two year anniversary this Saturday with a party and the launch of two new flavors, Sea Salt Caramel Corn and Roasted Peanut. Join Jersey City Ties for their Hamilton & More Karaoke Night at Brightside Tavern beginning at 7pm. The evening will act as a fundraiser for Jersey City Ties to help support their community service events and will offer karaoke, food, drinks, trivia, and a silent auction.